The Supersuckers are going to be bringing it to town, and the Supersuckers are going to be getting on down. Great Googly Moogly. The kings of rock always are always down at the quarry mining the fresh rock slabs for you, the discerning rock n roll fan, so throw up the devil horns, let out a holler, and get read to feel the raw power. Just a heads up. The Supersuckers are going to be returning to 3 Kings Tavern on Saturday November 7th. Don't miss it. I never was a huge fan of the Pogues but always liked what I had heard from this band. So when I saw they were coming to town I knew that I wanted to see them. Even if it was just to put another notch on the list of bands I have seen. I didn't go in with high expectations but I thought the band sounded great. Once I recovered on Saturday and got around to listening to my recording I was really pleased with it and wanted to share. I hope you enjoy it. The first time I saw the Murder Ranks I had no idea that there was a Warlock Pinchers connection. I think that I came out to see them based on a recommendation from a friend. At the time they didn't even have a band name yet. I labeled my recording "Band_With_No_Name.WAV". Anyway I was blown away and became an instant fan and try to catch them anytime I can. Then it was explained to me that Dan Wanush was King Scratchie of Warlock Pinchers fame. Neat! Then I started hearing rumors that mid summer that Andrew Novick was rehearsing with them and that at some point there was going to be a Murder Ranks show and that they were going to be playing Warlock Pinchers songs. This is that show and lets cross our fingers for a possible full band Warlock Pinchers show. This recording is from a rare, full band, Drag The River show. 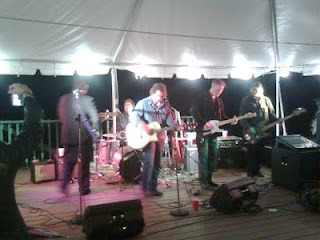 They played at a wedding for a couple that I have become friends with over the past few years. I thought it turned out really nice so I wanted to share it with you all. Jason Livermore played drums on the first 11 songs. Other folks filled in for the rest of the set.